Feb 5, 2019; Syracuse, NY, USA; Syracuse Orange guard Tyus Battle (25) looks to drive during the second half of the Orange's 80-62 loss to FSU at the Carrier Dome. Mandatory Photo Credit: Initra Marilyn, The Juice Online. 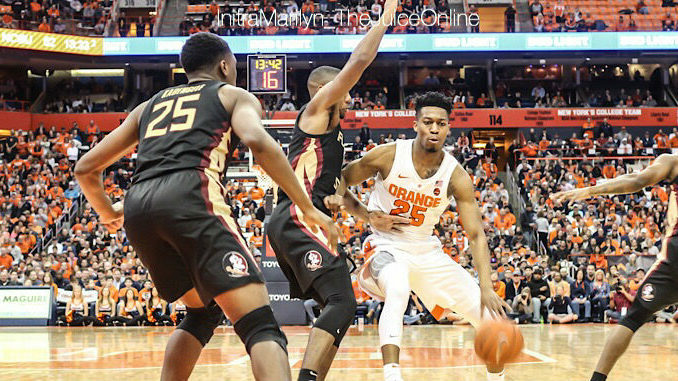 WHAT HAPPENED: After three free throws from Elijah Hughes with 10:11 left pulled Syracuse to within 55-52, the Seminoles scored 12 unanswered points. By the time Phil Cofer made a pair of free throws to cap the run, FSU extended to a 15 point lead with 6:25 left, and Syracuse could never threaten from there. SU was in trouble nearly immediately, with Florida State racing out to a 33-12 lead. Syracuse coach Jim Boeheim employed a full court press and the Orange rallied to cut the deficit to 39-31 heading into half. ANALYSIS: Syracuse’s loss can be attributed to three main stats: (1) 5-20 from beyond the arc; (2) 14-23 free throw shooting; and (3) an unsightly 18 turnovers. The Orange generated decent looks for their outside shooters, but only Elijah Hughes (4-9 from 3-point land) was able to take advantage. Buddy Boeheim, who had made at least one 3-pointer in his last seven games, went 0-6 from downtown. Oshae Brissett (4-8) and Frank Howard (0-3) were the biggest culprits from the charity stripe. And Tyus Battle and Hughes each had four turnovers in a forgettable night. HERO: Mfiondu Kabengele and Terance Mann combined for 40 points, including a perfect 6-6 from 3-point land. Battle led the Orange with 23 points. ZERO: Syracuse squandered an opportunity for a potential Quad 1 win, with Florida State currently sitting at 31 in the NET rankings (a Quad 1 win is awarded at home for a top 30 win). Aside from an upcoming home game against Quad 3 Boston College and a later road game against Wake Forest, SU matches up in all Quad 1 games. It’s make or break time for SU’s NCAA resume. WHAT’S NEXT: Syracuse hosts Boston College on Feb. 9 at the Carrier Dome at 2 p.m. TV: ACC Network.